An orb chandelier with an open look inspired by Arts and Crafts as well as industrial designs. From the Franklin Iron Works collection of chandeliers, the orb chandelier design features an open round frame in an antique bronze finish. Twin bands encircle the inner band with the lights. Bulbs are concealed behind four white glass elements. Top canopy is in a matching antique bronze finish. 22" wide x 23" high. Canopy is 5" wide x 3/4" high. Weighs 12.1 lbs. Shade is 6 1/2" high x 3 3/4" wide. Includes 6-feet of chain, 11 1/2-feet of wire. Sloped ceiling adaptable. Four maximum 60 watt or equivalent type A Edison bulbs (not included). 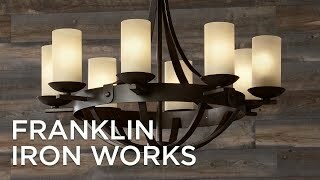 Rustic farmhouse 4-light orb chandelier from the Franklin Iron Works™ collection of chandeliers. Antique bronze finish with white glass. BEST ANSWER: Yes, we have ours on a dimmer! We love this light fixture!! Are the white glass cups open at the top? My concern is dust and bugs will get in there. BEST ANSWER: The glass shades have an open top. How close can this be hung to the ceiling? BEST ANSWER: The overall minimum hanging height is approximately 25". You can hang it as close as a few inches because you can just cut the chain to your desired length. The minimum would probably be one link in between the loop on the top of the light, and the loop on base on the ceiling, which would probably be approximately 3inch. Does this light come in a larger size? BEST ANSWER: This does not come in a larger size however we have a great selection of larger size styles. Does this provide enough lighting? Is it bright enough? BEST ANSWER: Hi, the light uses four 60W max light bulbs. If more light is needed, you can use an LED bulb with a greater light output. I have attached an LED bulb with a greater light output. Can you please advise what type of bulbs (from the ones you sell) would fit this chandelier as they seem to have different base sizes? BEST ANSWER: I have included a set of LED bulbs that will fit this chandelier. When I ordered this chandelier I ordered the suggested lightbulbs as well. It was a great time saver because I ordered all the lighting for a new house and by ordering the suggested lightbulbs it saved me a lot of time. It has a standard bulb size bottom. I bought 4 candelabra shaped LED bulbs, dimmable 60 Watt equivalent. It is plenty of light. Can the white globes be taken off? BEST ANSWER: Hello - yes, they can be removed. However, since the chandelier was designed to have them, the sockets are probably not decorative enough to be exposed. Easy and quick pick up. Looks really nice hanging in my eating space. Have it hanging over a 36” round table. Provided plenty of light. I have it on a dimmer switch. Love this chandelier! Looks great, good quality and easy to hang. When it goes on sale again I’m planning to buy another for our entryway. This looks very airy in my dining room. Lots of light and doesn’t seem overly intrusive. I like the update to my room. A graceful whirl design defines this wonderful 12-light swirl chandelier.